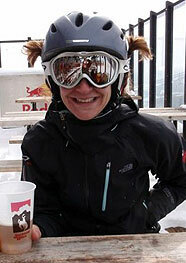 Alyssa Davis is a well traveled Ski Adventure Designer, who has been in the ski industry for over 21 years. 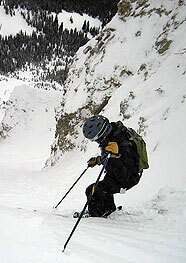 Her passion for skiing and travel has led her to every resort SkiTDS offers in addition to many more. Alyssa believes that experiencing life with family and friends is the key to happiness. She is available to help fulfill your needs and desires with her massive amount of knowledge of our winter destinations. 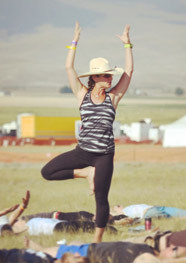 Outside of trying to ski every month of the year, you can catch Alyssa teaching yoga, running the mountains of Montana, and getting outside with her husband, two teenage girls (send help), and her two dogs. 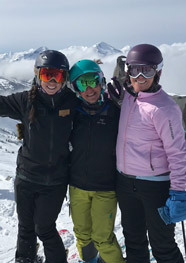 Alyssa's favorite ski experience (being in the ski industry has its benefits) was getting to ski fresh powder all day in Whistler this past April with Canadian Olympic skier Aleisha Cline. She helped me arrange the trip I wanted and also facilitated a change in dates without penalty. Alyssa was great, she recommended Keystone because I was bringing my children, and helped me reconfigure my vacation plans a couple of times. She was very helpful answering any and all questions I had. She reschedule 2 travelers shuttle without a hitch after our flight was delayed. Very helpful great communication a joy to deal with. (How likely are you to recommend us to family, friends, and coworkers?) Definitely will recommend... Alyssa was very accommodating, organizing our trip completely. She was very informative and answered all my questions concerning other local activities. She helped make our vacation fantastic! 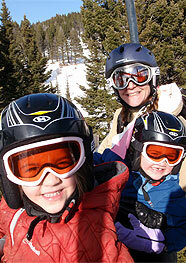 Knowledgeable about ski areas, ski villages, transportation and accommodations. (Would you book another ski vacation with us again?)... Yes. As long as Alyssa is with you. She is always positive and listens to my wishes, and then she delivers. She is professional and makes sure everything works out as planned. Best of all she is available on her cell, so when I am worried about anything, she has the answer and solution. (How likely are you to recommend us to family, friends, and coworkers?) Definitely will recommend... Alyssa has helped us book our ski trips for several years, and she always find what we wants for a good price. I was unsure about actually going on this trip, but when Alyssa called me, and recommended cheaper options, I was very excited about going on this trip. She was very helpful and helped make this trip great. Alyssa did a great job on organizing all of our lift tickets and transfers which was very convenient for us and we saved quite a bit of money too. Now that we found you...we will contact you to help with accommodations too (we had already done this legwork before contacting Alyssa). (How likely are you to recommend us to family, friends, and coworkers?) Definitely will recommend... Because Alyssa was outstanding with the service she provided. (How likely are you to recommend us to family, friends, and coworkers?) Definitely will recommend... Alyssa was great! She was very attentive and quick to respond to my emails and was almost always available for me to call or responded in a timely fashion. (How likely are you to recommend us to family, friends, and coworkers?) Definitely will recommend...Alyssa was such a big help and we loved the customer service and our reservation was absolutely perfect!!! Thank you Alyssa she deserves a raise! She was available and very knowledgeable. She was a great help. Alyssa Davis was an excellent Ski Travel Specialist. We have had the pleasure of her help several times. Alyssa was very cooperative and punctual. It was pleasure working with her. (How likely are you to recommend us to family, friends, and coworkers?) Definitely will recommend... Alyssa was very cooperative and punctual. It was pleasure working with her. (How likely are you to recommend us to family, friends, and coworkers?) Definitely will recommend... Alyssa was very helpful in the planning of our vacation and answering all my questions and offering suggestions. It was nice that she had been there and stayed where we ultimately decided to stay (which was awesome). Alyssa was terrific. We will call her directly next time we are planning a trip. Professional, knowledgeable. Top notch. (How likely are you to recommend us to family, friends, and coworkers?) Definitely will recommend... Alyssa Davis was so helpful so working with Tours De Sport was just such a pleasant experience. We have stayed at Okemo for 10+ years and this was one of the nicest condos we've rented. Alyssa was excellent and a pleasure to work with. (Would you book another ski vacation with us again?)... Yes. I loved that Alyssa was familiar with the accommodations, with Ski Butler, and the resort. I loved Alyssa! She responded quickly and gave accurate and excellent information. The pricing she provided was reasonable for the high level of vacation we enjoyed! (How likely are you to recommend us to family, friends, and coworkers?) Definitely will recommend... Our coordinator, Alyssa, recommended excellent lodging, Ski Butler equipment rental, and car rental! Very helpful and responsive to our requests. Alyssa's very knowledgeable and helpful. (How likely are you to recommend us to family, friends, and coworkers?) Definitely will recommend... Alyssa knows her business and makes our ski trips trouble free. (How likely are you to recommend us to family, friends, and coworkers?) Definitely will recommend... You got us a great deal on a great place! (Would you book another ski vacation with us again?)... Yes. Alyssa made everything so straightforward and easy. Alyssa was very knowledgeable, courteous and efficient. (How likely are you to recommend us to family, friends, and coworkers?) Definitely will recommend... Alyssa did such a great job for us. I have already referred another customer to her who hired her to plan a trip to Aspen for them over the Christmas/New Year holidays. Alyssa was very helpful and always replied fast. Alyssa was very accommodating, especially when I had to change my package. Alyssa is always super helpful! I loved that Alyssa was familiar with the accommodations, with Ski Butler, and the resort. Our coordinator, Alyssa, recommended excellent lodging, Ski Butler equipment rental, and car rental! Alyssa Davis was so helpful so working with Tours De Sport was just such a pleasant experience. We have stayed at Okemo for 10+ years and this was one of the nicest condos we've rented. Alyssa Davis was very nice and helpful will definitely use her again. Alyssa was very helpful in the planning of our vacation and answering all my questions and offering suggestions. It was nice that she had been there and stayed where we ultimately decided to stay (which was awesome). Alyssa was always there for me. She answered my questions in a timely matter. Went above and beyond to help. I had a mix-up regarding my son's school schedule and needed to reschedule my trip. Alyssa was very willing to assist. Alyssa is very helpful, informative and pleasant to work with. Very personable, responsive, informed and efficient. Alyssa made excellent recommendations and was just what I needed in a travel specialist. Alyssa was extremely helpful and accommodating with scheduling and planning our trip. I have worked with her in the past and look forward to working with her again. Alyssa seemed very knowledgeable. I prefer to work with an agent that had a first hand experience with the facilities they are recommending. In fact, Hotel desk reception girl said that Alyssa had visited, she remembered her, and upgraded me... (What do you recommend) Nothing. Keep up the good work! Kudos to Alyssa, she's great! I thought Alyssa did great this was the first vacation I planned and she helped me with every question I had. Alyssa was absolutely fantastic, I would use her again in a minute, or recommend her if that came up. Alyssa is the BEST! We have worked with her for many ski holidays, and she always delivers. Perfection! Alyssa was very helpful, knowledgeable and great to talk with! Appreciate prompt response and follow up. Professional and organized. Friendly. Great service, atitude and profesionalism. Alyssa was resourceful and awesome. Alyssa is fantastic. I met her last year when she helped us plan our ski vacation and plan to work with her to book many more ski vacations in the future. Alyssa was very accomodating and always had updated quotes for us as soon as we requested them. You do a very professional job. Alyssa handled everthing through the phone on one call. Service and extremely responsive to the queries. Second year booking with Alyssa, and we will be booking again next year - very very happy! Have worked with the same agent for several years and contact her directly when I want to ski out west. With the report we have I feel she gets me the best deals. Alyssa quckly responded to all my questions and all my documents were waiting for me at the Bridges desk when we arrived. I couldn't go on a major ski trip without Alyssa's help and suggestions! Alyssa Davis is the best. 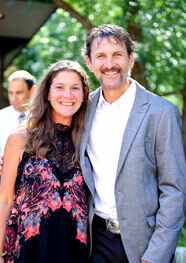 Alyssa DAVIS has helped us with our ski trips for over 10 years. This trip to CO was also fantastic. cant wait for our trip to Portillo in AUG.! Alyssa put it all together and made changes for us as we needed. Everything went smooth and easy. Thanks for an awesome trip. Because your service and price are very good. There could not have a better person. Alyssa was awesome. She helped us make the final decision on selecting Sunday River and was able to accommodate our special request. This is not the first time we have used Tour de Sport...we will use you again...no complaints from me! Was the most amazing trip. We loved vt, and sugarbush. Snow was awesome!! Thank you Alyssa for all of your great advice and time/effort in planning our trip! We really appreciate her help in planning this trip, it was a very special one. I got engaged! Alissa really helped us in our decision making and planned everything perfectly. We were so happy with how wonderful our vacation was. Thank you! Personal, prompt, knowledgeable, patient. I will book again because you make it your business to be ski specialist. Always prompt in replying to queries and very helpful. Knowledgeable, patient, reliable. A wonderful resource. Alyssa Davis is fabulous! We had a wonderful trip. Alyssa did a great job with all the arrangements, knows our preferences and organizes the trip around those preferences. Alyssa went over and above in accomodating all my questions - she was a pleasure to work with...thx! Never dissappoints, makes my life easy, 1 call and my vacation is planned. Alyssa was awesome. I changed my intended plans like 5 times and she would always get back to me with a new great package. She was always very quick to get back to me via phone and email. You hooked us up again. You make putting a trip together for a very diverse family painless. We are looking forward to experiencing Breckenridge for the first time. Again, thank you for all your help. Alyssa is very knowledgable and provided excellent service. It's so easy and everything runs smoothly. Also, Alyssa's knowledge of ski areas is very helpful. Great job, we had to change plans and Alyssa did this so easily for us. I've been working with Alyssa for a decade through several different companies. I will follow her to wherever she goes because she has always been able to accomodate my diverse needs. We loved the place Alyssa picked for us. It was perfect! Alyssa was very helpful and a great adviser. Alyssa was very responsive to our needs. Alyssa couldnt have been more helpful. I look forward to booking more trips with her next year. Alyssa was great...every details was perfect! Alyssa was very helpful and explained the difference between the two hotels we were considering with knowledge and experience. Alyssa was great . Helped me a lot in the decision of where to go since I had no clue and also helped with the type of lodging. The only thing better than our vacation was working with Alyssa. Alyssa was very supportive and helpful, the prices were competitive and her ability to accomidate last minute changes helped minimize stress. Alyssa saved me ~$500 by warning me that an extra day on the mountain would lead into a holiday weekend. That was much appreciated. Alyssa has helped plan our ski vacations for over 10 years and she is great. As long as Alyssa Davis works for you we will book through your company. Alyssa handled complexities of my trip well. Thanks for the help, overall a good experience. Overall experience was good. You got me some options that I may not have found myself. Alyssa, you have been extremely helpful and easy to work with. Your attitude and enthusiasm is awesome. I can't believe this was so effortless and your pricing beat our normal travel agent. Great Job and Thanks for your help. Alyssa was very patient with some last minute changes. Very helpfull and made a great suggestion on location for us. It was great working with Alyssa. She was wonderful. Definitely will be using her for our next vacation! Alyssa was able to get us a great package without any hassle. In the future I will be using Alyssa to book my ski trips. Pricing & service was excellent. Our rep was quick to respond to our request and listened to what we wanted. Hi Alyssa. Just returned form Jackson Hole last night and wanted to thank you and give you some feedback for the future. First and most important, we had a ball! The flights, hotel transfers and hotel accomodations (Snow King) were perfect. No hassles what so ever. The Ski Butler service was also terrific. They could not have made it easier. In fact, we arrived at noon (earlier than expected) and had the opportunity to ski free for the afternoon at the Snow King's on site ski area. I called Ski Butlers to see if it was possible to get the skis delivered prior to our 4PM agreement. Their response was "we'll be there in 10 minutes"... and they were! Great service and better skis for the conditions than I would have had if I brought my own! One suggestion for others in the future... It would have been good for us to have purchased breakfast vouchers as part of our package. Without the vouchers, breakfast was $12 (+) per person in the hotel restaurant. That was for a full breakfast buffet, but it's pretty steep if you just want an 'on the run' continental breakfast on the way to the slopes. Due to the hotel location, there were no other easy options for a breakfast restaurant. This is the second 'hassle free' trip I have purchased from Tours De Sport. You have done a terrific job on the trip information, booking and personal follow through (yes, I got your VM!) and I will surely use your servies again in the future. Made my life easier and we were happy with the package price. She was friendly and very professional. We had a great trip with no problems. Uneventful, the way I like it. Alyssa ROCKS!!! She always, always delivers a fantastic ski vacation. She's the best!!!... I booked with Tours de Sport because Alyssa works for you. Alyssa was great and so was the trip! She even called us after we arrived to check on our accommodations. She was great! Alyssa was very professional and courteous. Everything was well organized and met our expectations. Alyssa has been our ski travel specialist for many years and we go back to her year after year b/c she does such a good job. Knowledgeable, made the selection and booking process easy. Price was good. I will refer any friend I have to Alyssa for help in booking a ski vacation. She was excellent, there wasn't a glitch with the trip, and I'll use her again. She seemed to always be available and was extremely helpful.